The Marquis Los Cabos Resort is an all suite luxury Mexico getaway with a health spa, located on the southern-most tip of the Baja California Peninsula in Mexico. Go fishing from September through November, scuba dive, snorkel, or join a bike tour on the trails around Los Cabos. For those looking for something more indulgent on your travels, visit the Spa Marquis, a 15,000 square-foot ocean-view full service spa. Golf services include reserved tee times at nearby golf courses, swing video analysis and private golf lessons. This all suite hotel has 237 suites, including 203 Junior Suites, 5 Marquis Suites, one Grand Marquesa del Mar Presidential Suite, and 28 casitas with private pools. Suites and casitas have open ocean views of the Sea of Cortez. Frette bed linens, contemporary Mexican style furniture, and Bulgari toiletries are some of the luxury standard room amenities at the hotel. There are three restaurants at the resort, with in-suite dining available 24 hours. Private catering for dinner parties in suites and casitas is also available. The Canto del Mar is an elegant 30-seat restaurant serving guests on either the outdoor terrace or indoors. Vista Ballenas serves California and Mexican cuisine for breakfast and dinner. The Dos Mares Restaurant and Bar is located poolside and specializes in seafood. The resort is located in the Cabo Real section of Los Cabos 18 miles from the airport and six miles from the town of San Jose del Cabo. The resort can arrange airport transportation for guests. 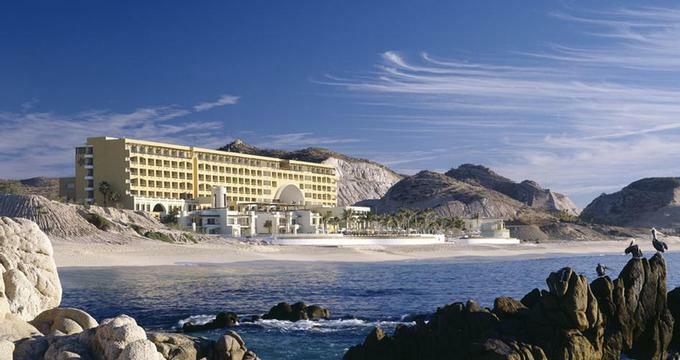 To reach Los Cabos in Mexico, fly to San Jose del Cabo International Airport. Los Cabos flights are provided by the following airlines: American Airlines, Alaska Airlines, America West, Continental Airlines, Delta Airlines, Mexicana, Aero Mexico and Aero California. Flights to Los Cabos take about 2.5 hours from Dallas, Los Angeles, Phoenix, Houston and Mexico City. If you are flying from the East Coast, the flight will take about 5.5 hours. Click here for Mexico packages. Rates start at $360 for a Junior Suite in the summer; from $440 in the fall; from $550 in winter; and from $445 in the spring.